Bump. Set. Hit – Block! These are words that one DeKalb County School District (DCSD) sport team has gotten used to in the best way, earning a top record and many momentous runs at a state championship. 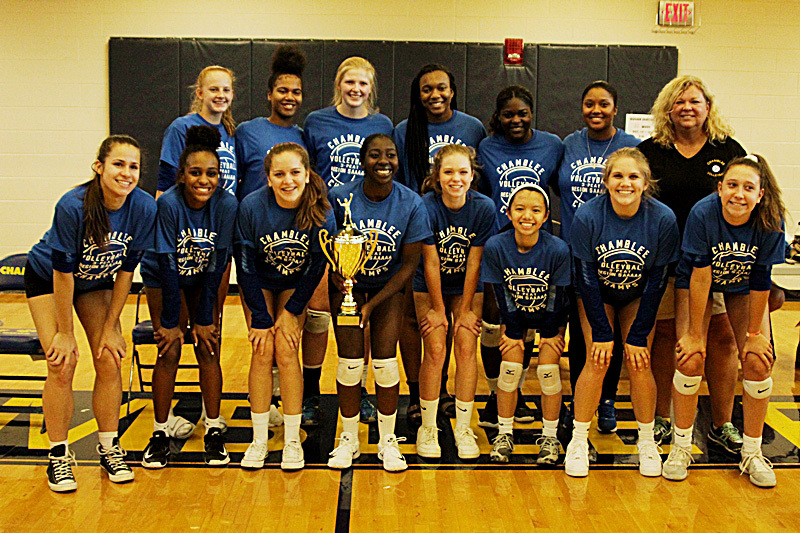 Chamblee Charter High School’s Lady Bulldogs Volleyball Team finished its 2018-2019 season with an impressive 41-7 overall record. The team was ranked second in the state this season, claiming its third regional title and earning its third entry into the Class 5A state volleyball playoffs, also known as the Elite Eight. According to coach Lorri Reynolds, success is nothing new to the Lady Bulldogs. The team has gone 56-8 in 2005, and made many deep runs in Georgia tournaments. For the past three years, Reynolds states she has been blessed with a squad of players with a good sense of teamwork, work ethic, and talent. Two standout players have been junior Becca Evans and senior Camille Vanleer, both of whom were named to the Class 5A All-State Honorable Mention list. 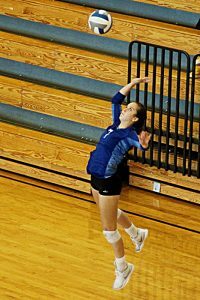 Evans, whose volleyball career started in sixth grade, plays as an outside hitter for the Lady Bulldogs, one of the most important roles of the team’s offense. According to Reynolds, she led the county and state in service kills—points scored on a serve. At one point during the 2018-2019 season, she led the entire nation. Evans’s talent has been honed by A5, an Atlanta-based club team that requires players to play year-round. The club is considered the third best in the country and a deep well of volleyball talent. Evans’ emotional attachment to the game is the source of her tenacity. If her team is winning, she’s happy. If her team is struggling, her frustration knows no end. No matter what, Evans appreciates how volleyball makes her be present in the moment and without distraction. Off the court, Evans appreciates who volleyball has introduced her to, where it has taken her, and what it has taught her. She has friends she has had since sixth grade; she has learned how to manage her time; and given her a fantastic work ethic. Because she plays for Chamblee Charter High and A5, Evans is forced to do homework well in advance or risk having to do it late at night. She considers herself fortunate, as she has witnessed peers struggle to maintain course loads. In the same sense, volleyball may be taking Evans somewhere in the near future. 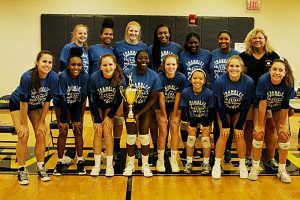 Camille Vanleer will look back on the 2018-2019 season as the best in her four years at Chamblee Charter High. Like Evans, she began her volleyball career in middle school and has played for outside club teams, including Tsunami and A5. Vanleer, standing at approximately 6’0″, is one of Chamblee’s leading blockers and defensive players. She was led to the game by her uncle, who also played volleyball, after he noticed her height differential. The decision has led to some of her best high school experiences. 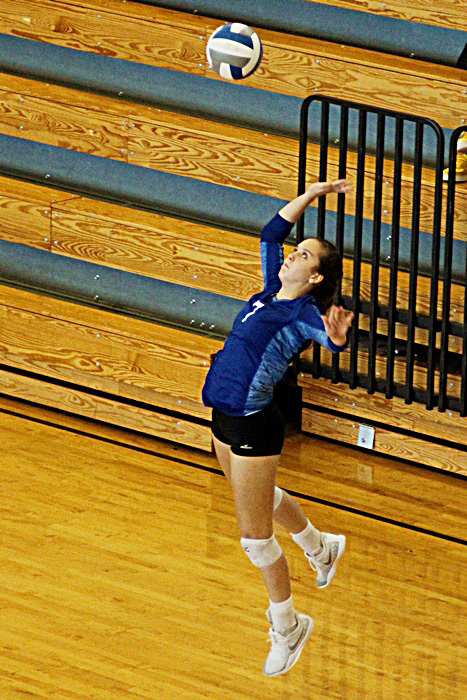 Vanleer’s favorite aspect of volleyball is its team-oriented nature. She considers volleyball one of the truest team sports because of its requirement that every teammate be in sync with one another. She claims there’s nothing quite like a close game that could go in any direction. Vanleer said playing volleyball has changed how she interacts with people. Her exposure to competition and teammates has changed her overall perspective. Upon graduation in May, she also hopes to bring her talents to higher education.